17 Mar 2014 / 12:25 H.
Soh and Zaquan getting the hang of the game. 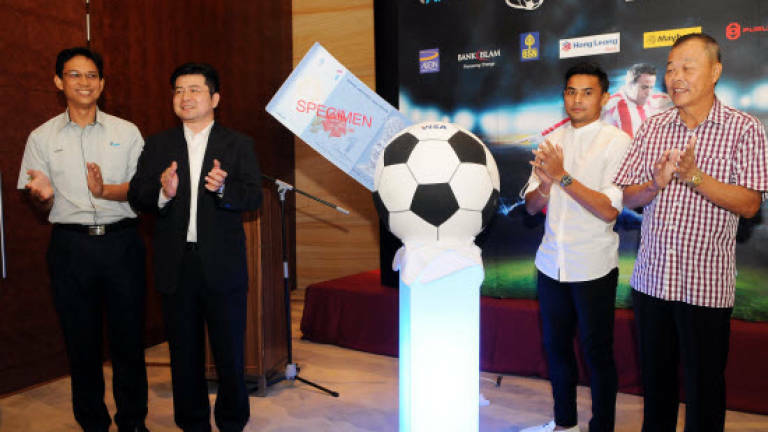 Azman Hasim, Visa Malaysia director of business development Ng Kong Boon, Zaquan Adha and Datuk Soh Chin Aun offi cially launching the 2014 Financial Football Malaysia competition. competition is open to all Malaysians, permanent residents and those above 18 years old, who are registered under the Malaysia My Second Home (MM2H)scheme. 1. The game requires players to answer a series of multiplechoice questions to advance down field. In promoting good governance on monetary issues and financial matters, Visa, together with itsbank partners, will distribute brochures featuring simple tips and guidelines.